The Great Ocean road runs 300 kilometres from Torquay to Warrnambool. It is a rugged coastline with spectacular eroded clifflines and rock formations. 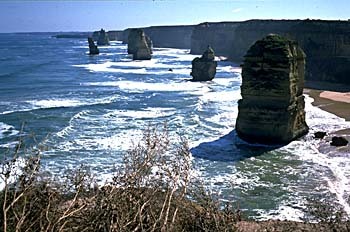 The Great Ocean Road is most spectacular towards its western end around the tiny secluded seaside town of Port Campbell. 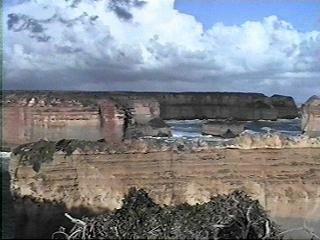 Along this section of the coast sheer sandstone cliffs drop 30m into the ocean. In Port Campbell National Park, the Twelve Apostles and Loch Ard Gorge are to be found amoung other eroded rock formations created by the force of the pounding oceans over thousands of years. The coast has earnt the repuation as the shipwreck coast with over 100 ships carrying settlers to Australia wrecked against its eroded cliffline in often treacherous weather. On the Surf Coast, where the cliffs recede at the eastern end of the Great Ocean Road, are some excellent surf beaches. Bells Beach is the best known as it hosts an international surf carnival. This guide points out attractions on the Great Ocean Road from east to west. From Anglesea through Lorne to Appllo Bay the road hugs the steep granite hills descending into the sea. Numerous holiday houses line the coast. Beyond Apollo Bay the road goes inland through dense fern forests of the Cape Otway National Park. (There are also fern forests in the hills behind Lorne and Apollo bay).A 20 kilometre long gravel sideroad leads to the Cape Otway Lighthouse, the second most southerly point on mainland Australia. The road eventually returns to the coast in Port Campbell National Park where 30 metre high cliffs decsend straight into the sea. The coast is indented from the waves cutting into the soft sandstone cliffs leaving spectacular rock formations. The Tweleve Apostles are stone pillars proruding from the sea and the most famous rock formation along the coast. Gibsons Steps, 500m east of the Twelve Apostles, lead down the side of the cliff to the beach at the bottom of the Apostles. 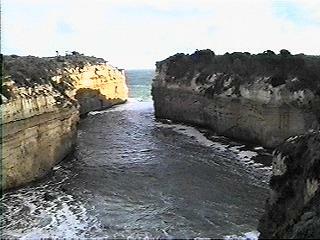 Loch Ard Gorge is also spectacular and has an interesting history about shipwreck survivors. There are several other caostal rock formations signposted along the road. Port Campbell, in the middle of the national park, is a picturesque fishing village. Boat tours of the Apostles are available from here. The road continues on to just before the large town of Warrnambool. Here the Flagstaff Hill Maratime Village tells of the history of the coast. Touring by car the coast takes at least one day from Melbourne and staying the following night in Warrnambool. 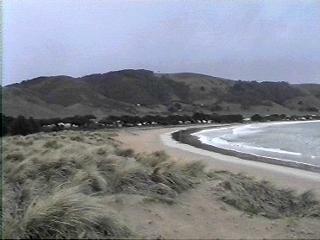 The Surf Coast has great surf beaches, especially around Torquay. Bells Beach is world famous because of an annual surf competition, but Jan Jac is reliably the better surf beach. Both beaches are near Torquay. Anglesea, Lorne and Apollo Bay have surf beaches. Surf beaches further west are isolated and very dangerous with strong undertoe. One day bus trips are available from Melbourne returning late in evening. Most tour bus operators are located on the east side of Swanston Street bewteen Bourke and Lonsdale Streets. Boat tours of the Twelve Apostles are available from Port Campbell pier (Port Campbell is very small and the pier easy to see. It is on the eastern side of the cove). From Melbourne drive 75 kilometres southwest to Geelong, then 30 kilometres south to Anglesea at the eastern end of the Great Ocean Road. This takes 90 minutes. Allow 2 days for a round trip from Melbourne or one very very long and somewhat rushed day. Public transport to the Great Ocean Road is almost non-existant. Local buses run irregularly between Geelong and Anglesea. 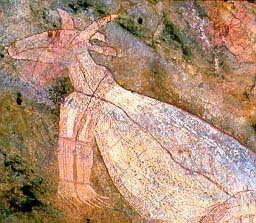 A far better option is to take a one day bus tour from Melbourne (see Organised Tours above). By car the Great Ocean Road can be explored in one long day. Surf Coast lies just to the east and encompasses the beachside towns of Torquay, Ocean Grove, historic Point Lonsdale and historic Queenscliff at the entrance to Port Phillip Bay. The surf beaches have waves excellent waves but still check the surf report before leaving to make sure the water is not calm. Geelong is 30 kilometres north of Torquay at the east end of the Great Ocean Road. Geelong is on the way to Melbourne City which is a further 75 kilometres northeast. Ballarat in the old goldfields is 120 kilometres north of Geelong. Warrnambool, Port Fairy and Portland are maritime towns progressively further west along the coast this rugged coastline. Grampians National Park encompasses a low mountain range north of Warrnambool. Mount Arapiles large rocky outcrop very popular for rock climbing.